As suspected from my earlier post where I shuddered at the thought of what Asif Ali Zardari might serve up to Washington during his trip to attend the UN General Assembly, well the games have begun. In a recent meeting with the Republican Vice Presidential nominee Sarah Palin, our Honorable President was seemingly a little bit too un-Presidential [?]. 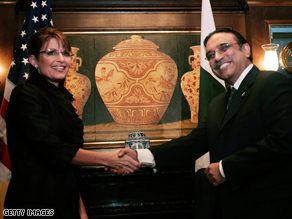 During the customary greetings between the two leaders, Zardari called Palin “gorgeous” and later even offered “to hug” the Alaskan Governor. I do not mean to suggest that this is in anyway a crime, but being the President of Islamic Republic of Pakistan there are some protocols that should be adhered to in an effort to uplift the respect and dignity of Pakistan and to the office with which he has been assigned to. It seems to have been the perfectly scripted conversation as temporal had predicted well before the actual Sarah Palin and Asif Zardari meetup. There maybe some fanatics in Pakistan who may even cringe at seeing him shaking hands with a women, but whatever the objection and whether we like it or not it has become a routine in western interactions and I might even suggest that such flirtatious comments might even be the norm but I dare to say, at least not on camera. It is quite possible that Sarah Palin considered these as a complement, but if you were to observe the video footage of the exchange she does feel a little uneasy. “You are so nice,” Palin said, smiling. “Thank you.” A handler from Zardari’s entourage then told the two politicians to keep shaking hands for the cameras. “If he’s insisting, I might hug,” Zardari said. Palin smiled politely. Love this site – will come back soon! You've got to be kidding. Right? The PM and Zardari have serious differences as it is. Here is my short order. Details to follow. "Status quo on Sherri Rehman should be maintained and both parties to exercise restraint." Jiye Asif Ali Zardari. Wah! A Flirt Guru.